There’s been much written about this insidious moral inversion – a charge made with varying degrees of explicitness recently by two British MPs – but there are two dynamics worth noting, leaving aside for the moment that such charges are deemed antisemitic by the EUMC Working Definition on Antisemitism. First, there is the suggestion – again, with varying degrees of explicitness – that Israel is engaging in genocide in Gaza. This charge, as we demonstrated in a previous post (‘Are Jews the Most Incompetent Ethnic Cleansers on the Planet? ), is so counter-factual that only those who possess a crippling hatred towards the Jewish state could even conceive of it. During the Shoah, half of Europe’s Jews (including 1.5 million children) were systematically exterminated by the Nazis. In Gaza, a blockade on weapons is being enforced by Israel to prevent the flow of rockets and other weapons from getting into the hands of Hamas, a group which launched thousands of such deadly projectiles at Israeli town over the years and is dedicated to the state’s destruction. The population of Gaza has increased from 82,000 in 1949 to more than 1.7 million today. Second, there is the moral inversion, in which a vocal minority of putatively liberal commentators see no moral difference between an Islamist extremist group whose founding charter calls for the mass murder of Jews, and the Jews who represent object of their immutable racism. Indeed, some have even convinced themselves that it is the Islamist extremist group which is the victim of Jewish aggression. This brings us to the following Tweets by Frank McDonald. @markhumphrys @irish4israel Comparison of Gaza with Warsaw Ghetto was valid. 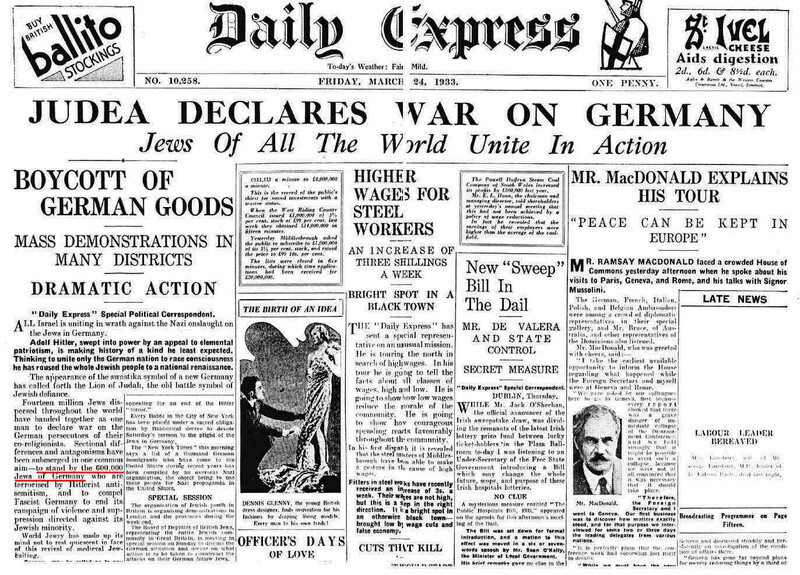 “We are putting the Palestinians on a diet”, https://commentisfreewatch.files.wordpress.com/2014/02/judea_declares_war_on_germany.jpgIsraeli guy said. The comparison between The Warsaw Ghetto is almost beyond comprehension, but a few facts need to be noted: in 1941 many Jews in the Warsaw Ghetto were limited to a diet of less than 200 calories a day, and in 1942 up to 5,000 Jews in the Ghetto were dying every month due to starvation. Not only is there no humanitarian crisis (yet alone starvation) in Gaza, but obesity has actually been a problem in the strip since at least the late 1990s. However, in case you’re in any doubt as to whether McDonald believes that Israelis behave like Nazis, here’s one final Tweet – one of several which evoke the Holocaust that you can see on his Twitter feed over the past several days. @JohnAHale @paversarogers @adamlevick It’s very unfortunate that the Israelis have behaved like Nazis, killing innocent women & children. Of course, if post-Holocaust taboos against demonizing Jews were still the norm, the suggestion that Israeli Jews behave like Nazis would render the author of such a hateful invective politically toxic to the progressive journalistic community. But, we clearly don’t live in such a place. Rather, the political realm we inhabit – a mere 69 years since the liberation of Auschwitz – allows for such odious charges in the name, often, of liberal, pro-Palestinian political commentary. The ideological toxins which inform the views of Frank McDonald will likely not be challenged by liberal left opinion leaders, and we can be all but certain that his editors at the Irish Times won’t blink an eye or even demand an explanation for his appalling racist smear of Israel’s six million Jews. It seems that this must be the same Frank McDonald who in 2010 admitted hitting a female manager of at hotel in Dublin because he objected to the noise emanating from the bar and nightclub. Perhaps Mr McDonald is not really the sort of person who should be lecturing others about civilized behaviour. He’s the very same violent hero. Being a hysterical bully and a card-carrying Jew-hater is a absolutely logical and natural . As usual with his kind of bullies, he complained to the judge of being restrained and forced to apologize. Absolutely, and now he supports certain other people who have the same propensity to beat up their women from time to time. I’d like to see psychological profiles of MacDonald’s supporters. What other absurd obsessions have possessed them as well? Anti-Israel bigotry, and sometimes outright antisemitism, seems to be on the rise in Ireland and in Irish media. Is anyone better connected over there able to tell me whether this perception of mine is accurate and, if so, explain why? Too many Irish have been Nazi sympathisers and collaborators. It is a peculiar sickness in that country, with some notable and honourable exceptions. Please do not tar us all with the same brush. Some of us have a deep and abiding respect for Israel. If I may be so bold, some of the problem is amplified with the idiots on each side of the Northern Ireland conflict choosing a side in the I/P conflict (Palestine for Republicans, Israel for Loyalists). And please do not take Eamonn McCann seriously. he, and his Socialist Environmental Alliance are a laughing stock. The “notable and honourable exceptions” actually comprise the majority of the population, of course. You are talking slanderous nonsense. On a different topic, I read this piece in jpost today about what really happened at Lydda in 1948. Very illuminating. How about organize Nomenklatura Hunter? It is Nomenklatura version of Nazi Hunter.